Homeowners in the Stoughton neighborhood describe police arriving with their guns drawn and yelling at them to evacuate. 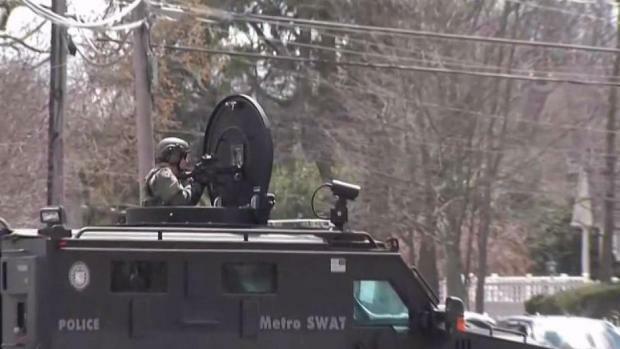 On Friday afternoon, Stoughton residents spoke about the chaotic afternoon after a "swatting" hoax prompted police to evacuate the area. 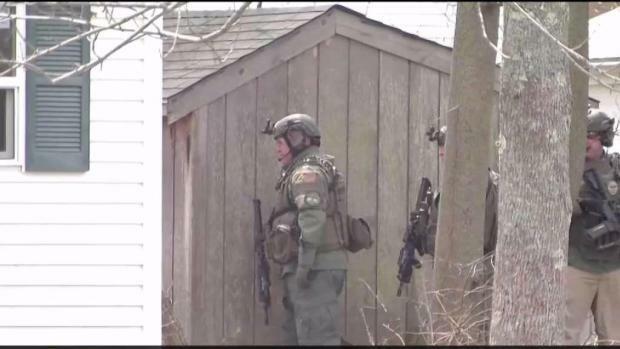 Stoughton police said they received a call around 10:30 a.m. Friday reporting that five suspects had entered 546 Pearl St. with machine guns, and that one male occupant was barricaded and hiding in a bathroom. Police quickly responded and set up a perimeter, and neighboring police, Massachusetts State Police and a regional SWAT team were called in to assist. "It was terrifying actually having a SWAT team in your backyard," said Danielle Pietro, who lives in the neighborhood. "Pretty scary stuff." Stoughton and Mass. State Police responded to reports of an armed home invasion in Stoughton this afternoon, which was later revealed to be a "swatting" hoax. Kim Keller said police came to her kitchen window and told her to evacuate. They told her there was a hostage situation in the building next door. "There are some sick people in this world. That's sad," said Keller. Many people who were not home when it happened rushed home to check on their families. "We were just kind of dealing with it minute by minute," said Stephan Norgdren. The multi-unit residential building and several neighboring homes and businesses were evacuated. The nearby high school was placed in lockdown. "In light of Officer Gannon's death, we thought that this was an appropriate reaction to such a dangerous call," said Stoughton Police Chief Donna McNamara, referencing last week's fatal shooting of Yarmouth Officer Sean Gannon. "Numerous resources were spent, but that's priceless to keep everyone safe." 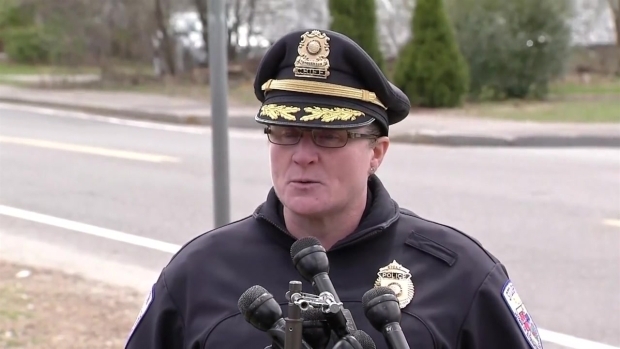 Police Chief Debra McNamara says the reported home invasion in Stoughton, Massachusetts was a hoax. 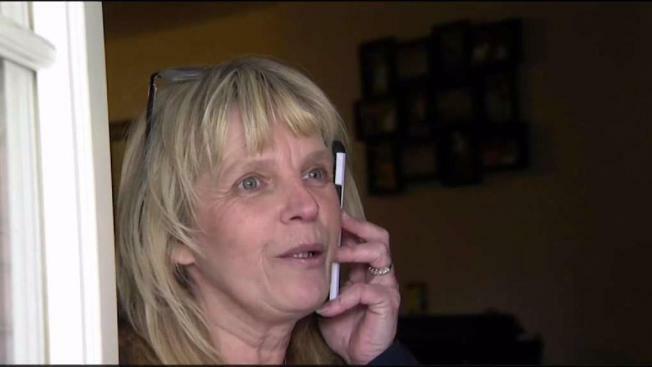 Eventually, the initial call claiming to be from inside the home was disconnected, and when police called back, a female answered and said she was out shopping and was not at home. She said her identity had been stolen within the last couple of days and her phone number was taken. The scene was cleared around 1 p.m. once it was determined that there was no danger. "It's very scary," said Amy Caroll, who lives in the building. "I don't know how people manage to do stuff like this." "Really frightening, especially when you have kids," added Vera Ferreira, who was evacuated from her home. McNamara said police are continuing to investigate in an attempt to determine who made the initial call. "It's unfortunate what we're dealing with," she said. "We're not the only community that has had swatting calls. This is a danger to not only the residents but the officers responding." Massachusetts State Police are responding to an armed home invasion on Pearl Street in Stoughton.